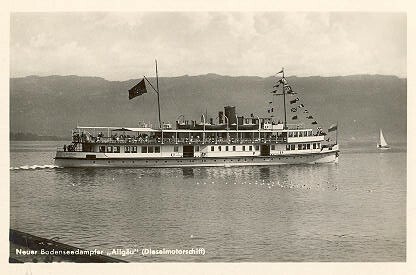 This page is devoted to postcards and photographs of the Bodensee (Lake Constance) diesel excursion vessel Allgäu. 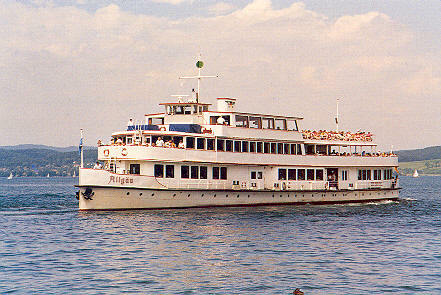 Allgäu was one of two large new Bodensee vessels delivered in 1929. 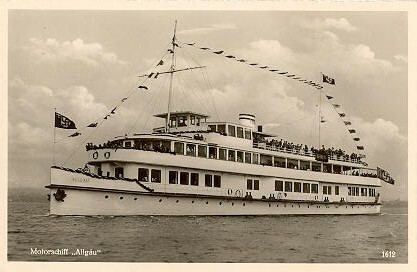 Allgäu was the first large motorship on the lake carrying over 1000 passengers. 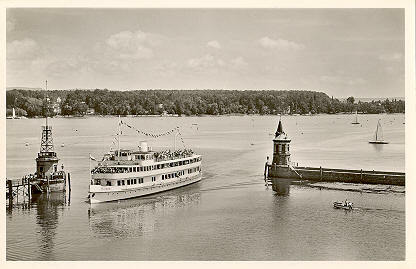 She entered service with Deutsche Reichsbahn on 14th August, a month before the Stadt Überlingen (the last and largest Bodensee paddlesteamer). 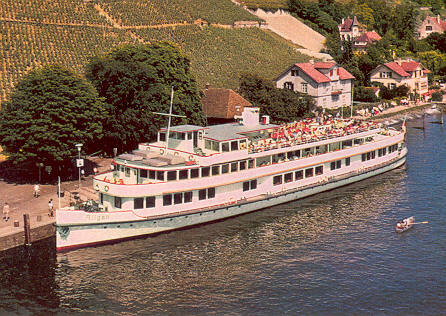 Allgäu cost RM 1,110,000, compared to RM 970.000 for the paddlesteamer. 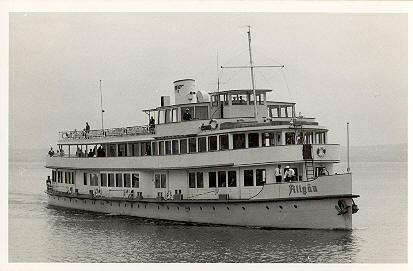 In 1935 Allgäu was rebuilt as a three deck vessel. 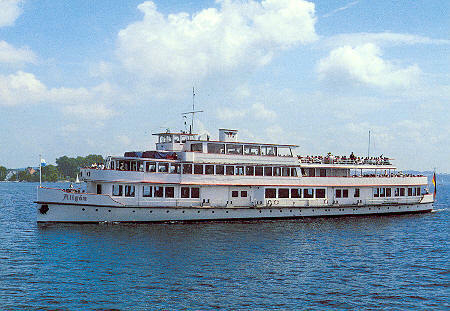 She served with Deusche Bundesbahn after the war, and remained the largest Bodensee ship until scrapped in 2001. Franz Walter (München) postcard serial Bd.13. 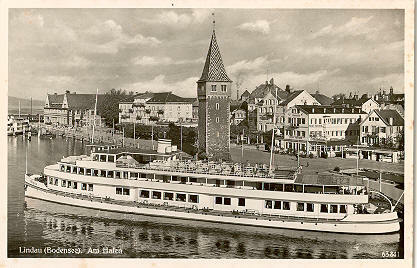 Erwin Burda (Freiburg) postcard serial number 63 864 of Allgäu at Meersburg. 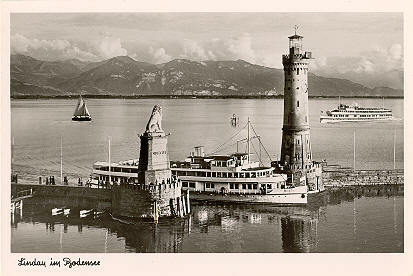 A.Hermann (Stuttgart) postcard serial number 166523/3b of Allgäu arriving at Lindau. 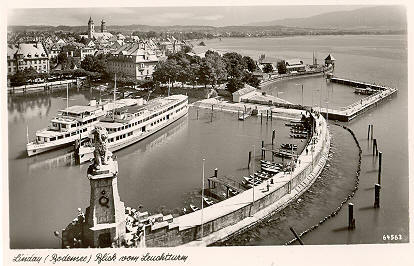 Vahle (Hagnau) postcard of Allgäu at Lindau, with the other 1929 delivery, the paddlesteamer Stadt Überlingen. 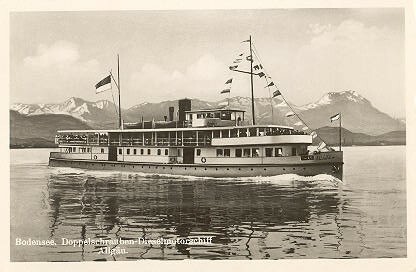 Erwin Burda (Freiburg) postcard serial number 86-63841 of Allgäu at Lindau. 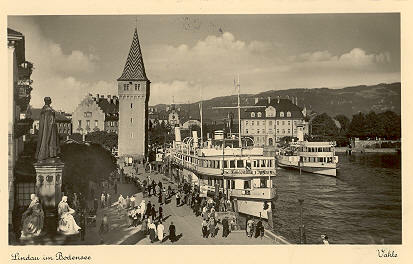 Metz (Tübingen) postcard serial number 145/507 of Allgäu arriving at Konstanz. 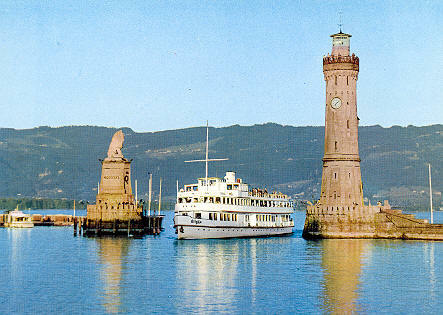 Erwin Burda (Freiburg) postcard serial number 86-64563 of Allgäu at Lindau, with the Lindau (ex-Deutschland). P.Ransome Wallis photographic postcard of Allgäu in postwar Deutsche Bundesbahn colours. 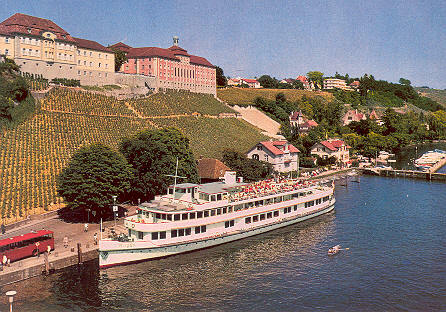 Metz (Tübingen) postcard serial number Of148/502 of Allgäu at Meersburg. 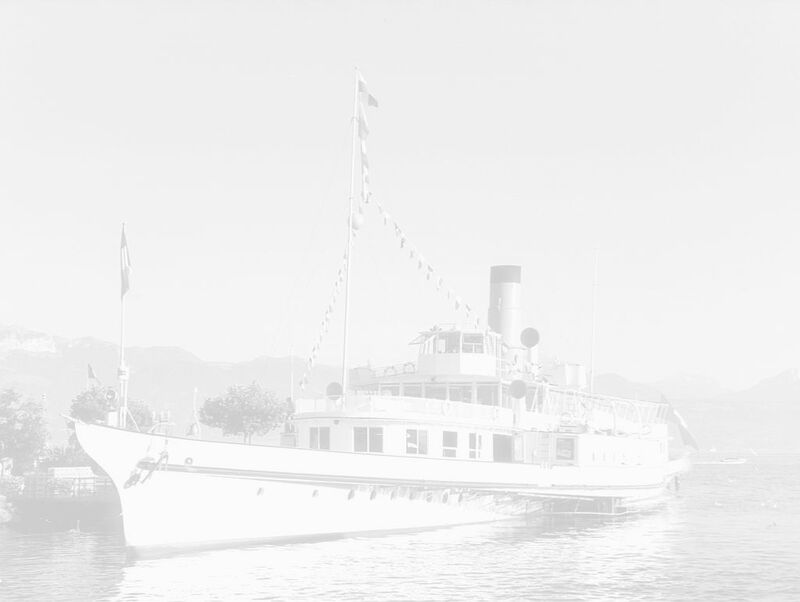 (enlarged image of the ship in postcard above). 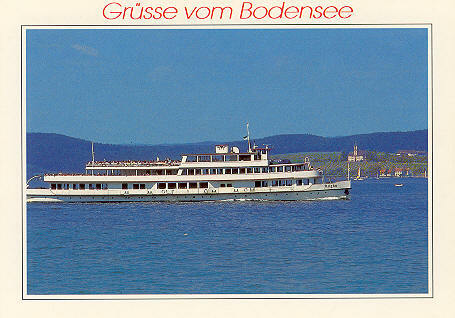 Postcard serial number 20004/91 published by "Bodan" of Allgäu arriving at Lindau. 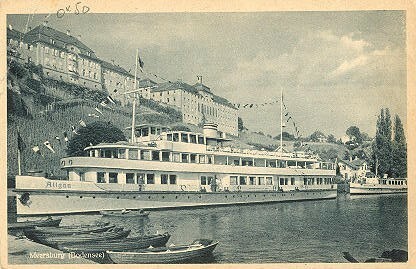 This is the card which was sold on board in later years. 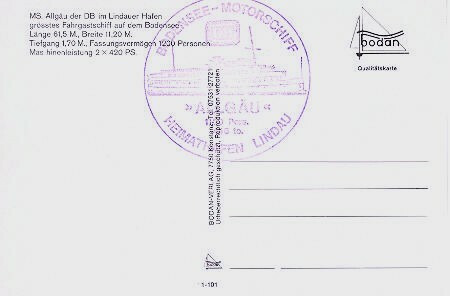 The card back with ship's stamp is shown below. Postcard serial number 20004/91 published by "Der Bahnladen"
Postcard serial number Bo/216 published by "Werner" of Allgäu in final condition.